Political parties do not matter when it comes to the practicality and functionality of border walls. Democrats say that walls do not work and even some Republicans echo that sentiment. I do not care if a Republican - most likely like former Ohio Governor John Kasich – says that a physical barrier is not necessary. They are politicians worried about public opinion for the next election. Talk to a Border Patrol agent, sheriff deputy or police officer in a border county and you will get the truth about the need for a wall. This week President Trump appeared with National Border Patrol Council President Brandon Judd at the White House press briefing room. Judd spoke about the effectiveness of a wall and the need for it and has experience on the border making him a valid voice of reason. 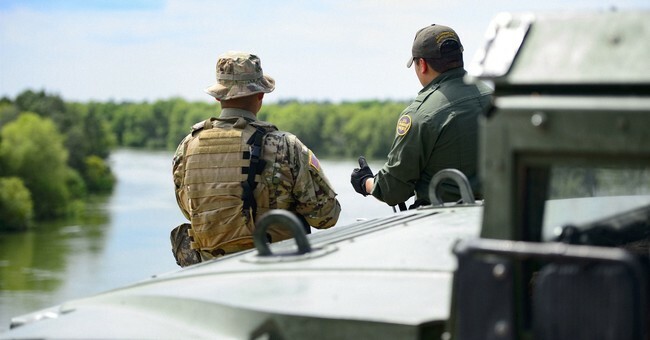 Judd spoke with the men and women who patrol the southern border. He has been told how a wall would help prevent thousands of illegal crossings annually. Illegal aliens would not have free reign to cross as easily, preventing and deterring unlawful entry. Leon Wilmont is sheriff in Yuma County, Arizona. He said that he cannot speak for others, but in his experience walls work in curbing illegal immigration. Wlimont said from 2005-2009 there was a 91 percent drop in service calls and arrests related to illegals. As recently as 2005, the Democratic Party was in favor of a border wall. Now, they have completely switched to an anti-wall stance. They have taken national security and safety and turned it into a political fight. The government shutdown rests directly on the shoulders of House Speaker Nancy Pelosi (D-CA) and Senate Minority Leader Chuck Schumer (D-NY). The White House has sent invitations and offered a compromise but they refuse to make any concessions. When dealing with the Left, one must understand their mentality. They are wanting to completely change the voting demographics of the United States. Their fight is not about compassion for others who come to America. If this was the case, they would be against illegal immigration and would not encourage amnesty. The Democratic Party is trying to get as many people who will vote for them as possible into the country and make them legal citizens. As soon as Democrats make an issue political, be aware. The same thing applies to global warming or climate change or whatever they are calling environmental issues this week. All that matters to Democrats is power and complete control. That is it. Nothing else. After the election of Trump, they see the Rust Belt disappearing. The black approval rate has been as high as 36 percent. They need new potential voters. If you want to know the truth, talk to a CBP agent. Forget what the “pundits” who are full of talking points and political motivation have to say on news networks. It should be a clue when certain news channels will not have anyone Border Patrol or border county officials on to speak. On the rare occasion that they do, the interviews are tense and short. That is because the mainstream media has an agenda. Yes, Border Patrol has an agenda, a lawful one. They have sworn to uphold the laws of the country, not change them to advance their political desires. Do not let politicians tell you what the southern border needs. Truly, unless they have spoken to the LEO’s on the border, they are clueless. If the politician agrees with Border Patrol, you can assume they are well-informed and educated on the subject. Otherwise, the squawking opposition is for political gain. John Dempsey is a graduate of American Military University and has a deep understanding of law enforcement issues and how they relate to the Constitution, society and our culture. He has also been published in BearingArms.com and AmericanThinker.com. He can be followed on Twitter @John_Demp83.